Physiognomy is a knowledge on proportions of a human face and attributes of proportional beauty in harmony of geometrical figures. The seventh page results the information on ratios of geometrical figures with astrological planets, that within the physiognomy allows to compare features of a human face to geometrical figures and planets, and to describe psychological features and properties of character traits in view of meanings of planets in astrology. And also the information on mutual appeal or attraction of people according to ratios of individual proportions in facial features with geometrical figures. Facial features and geometrical polygons. Physiognomy and properties of character traits. Analyses of a face in aesthetic medicine and surgery. Similarity of a human face with shapes of correct polygons in a context of physiognomy allow to speak not only about harmony of facial proportions, but also about properties of character traits. As from ancient Greek philosophy and numerology it is known that geometrical figures correspond with numbers. Namely Greek philosophers and numerologists compared numbers 3 and 4 to a triangle and a square, number 5 to a pentagon, number 6 with a hexagon and so on. Similarly according to parities of correct polygons with numbers it is possible to correlate features of human faces to numbers and to speak about properties of character traits according to numerical meanings in numerology. And also geometrical figures of correct polygons are comparable to planets in the seven-beam magic star which is known in astrology, that allows to speak about psychological characteristics of people and properties of character traits from the point of view of planetary meanings in astrology, that is shown on the chart. Numbers from 5 up to 18 in white circles symbolize the appropriate polygons. The sequence of polygons forms a spiral which is identical to the chart on the previous page. Near to polygons there are symbols of astrological planets which correspond to properties of character traits in the event that in facial features there are similarity to shapes of this or that polygon. The sequence of planets in a spiral corresponds to the order of planets in the seven-beam magic star which is shown on the chart on the right. The order of planets in the seven-beam star is shown by external arrows, and internal arrows specify the order according to which planets correspond with days of week in astrology, that by the way allows to compare week days to geometrical figures. Seven planets (sun - venus - mercury - moon - saturn - jupiter - mars) in the seven-beam star correspond to fourteen polygons in a spiral, but each planet corresponds with two polygons. One polygon has even quantity of angles, and the second polygon has not even quantity of angles. For example, the planet Venus corresponds with a hexagon which has even quantity, and also Venus corresponds with a 13-polygonal geometrical figure which has not even quantity of angles. Or the Sun corresponds with a pentagon which has not even angular number, and also astrological Sun corresponds with a dihexagon which has even angular number. The shown chart allows according to meanings of planets in astrology to describe properties of human character traits in a context of physiognomy. For example, if in facial features there are similarity to shapes of a pentagon or a a dihexagon then properties of character correspond to meanings of the astrological Sun. Or otherwise it is possible to tell that the man possesses psychological characteristics which correspond to solar meanings which are known in astrology. Also meanings of other astrological planets are peculiar to character of the man if in facial features there are concurrences to shapes of corresponding polygons. Namely if facial features coincide with shapes of any one polygon then one planet is significant, but if features of a half face coincide with shapes of different polygons then different planets are significant. That is the reason of harmonious or disharmonious proportions in faces of people, and also is the reason of psychological contradictions or absence of contradictions according to planetary correlations which can be seen on the chart. Astrological symbols of planets and conditional symbols of corresponding polygons on the chart are located in the form of a circle. For polygons with number of angles from 5 up to 11 there correspond symbols of seven basic planets: sun - venus - mercury - moon - saturn - jupiter - mars, and for polygons with number of angles from 12 up to 18 there correspond five maximum planets: proserpine (PR) - pluto (PL) - chiron (XR) - neptune (NE) - uranus (UR). The 16-polygonal and 17-polygonal geometrical figures have no parities with planets, as 12 planets are known in astrology, and the shown chart specifies 14 polygons. More detailed information on the shown parities of twelve planets with 14 polygons I shall try to publish in the future on pages of this website or other websites where the astrology is the basic theme. Blue lines on the chart show correlations according to which half faces of people have disharmonious proportions. For example, if facial features coincide with geometrical shapes of a hexagon and a heptagon, or a hexagon and a diheptagon then a face is perceived as disproportionate. Other correlations of polygons correspond to harmonious proportions in faces of people, namely if polygons on the chart are not connected by blue lines then facial proportions are harmonious. For example, if facial features coincide with geometrical shapes of a hexagon and an octagon then a face is perceived as proportional. In a similar way according to the shown chart it is possible to analyze harmonious and disharmonious proportions in features of human faces that can be necessary not only in physiognomy, but also in plastic surgery and cosmetology, or otherwise to tell in aesthetic medicine. In the shown chart disharmonious correlations of polygons are specified according to interrelations of five elements in the Chinese numerology, that is shown on the previous page. Namely correlations of hexagon with heptagon, heptagon with octagon, octagon with nonagon, and corresponding disharmonious correlations of variants of these figures are specified according to interrelations of five Chinese elements in numerology. And also disharmonious correlations of polygons in the shown chart correspond to positions in a spiral, that is shown on the following chart. Arrows specify positions according to which correlations of geometrical forms are disharmonious. Namely shapes of 11-polygonal figure are disharmonious to octagon and dioctagon. Shapes of 13-polygonal figure are disharmonious to nonagon and dinonagon. Shapes of 17-polygonal figure are disharmonious to hexagon and dihexagon. Thus, features of a human face are interconnected with planets and geometrical forms of polygons that allows to consider proportions of a face as view of geometrical ratios, and also allows to describe properties of human character traits according to psychological values of planets in astrology. For example, the profile of a face in the photo of popular singer Gven Stefani. As it is possible to see on this photo, the tangent line to a nose-tip and to the most expressed point of a forehead, and also the tangent line to a nose-tip and to the most expressed point of a chin are parallel to lines of a pentagon, namely these facial shapes correspond to proportions of a pentagon as slanting angles of these lines has size 72 degrees concerning a horizontal. The information about slanting angular sizes of lines in geometrical figures concerning a horizontal look on the previous page in this section of website. The tangent line to a nose-tip and to the least expressed point of nose bridge (KI in triangle JKI) is parallel to a line of dioctagon, namely the slanting angle of this line has size 56,25 degrees concerning a horizontal. It means that in facial features of popular singer Gven Stefani there are similarity to shapes of pentagon and dioctagon, that shows proportions of a half face and psychological properties of character traits. If to consider that pentagon and dioctagon are different geometrical figures then there is an inconsistency of proportional ratios, but if to consider that shapes of pentagon are coordinated with any geometrical figures then the face of popular singer Gven Stefani in profile is perceived as proportional. 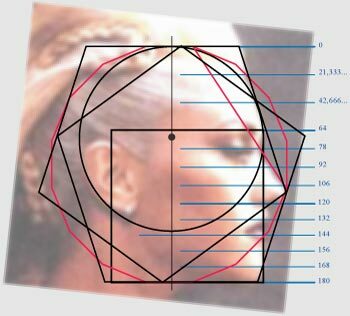 Besides in the photo of popular singer Gven Stefani it is possible to see that distance from top of a head up to the line of eyebrows is 64 zens, that corresponds to proportions of heptagon. The distance from top of a head up to the line of a nose is 120 zens that corresponds to proportions of dinonagon. The distance from top of a head up to border of a mouth is 140 zens that corresponds to proportions of nonagon. It means that proportions in the face of singer Gven Stefani in profile are harmonious, as between these geometrical figures there are no blue lines on the chart which is shown above on this page. Besides to character traits of popular singer Gven Stefani there correspond astrological characteristics of mercury and saturn and uranus which correspond to heptagon, to nonagon, to dinonagon. The line of a head top in the shown photo is invisible by hair, and consequently it is calculated approximately that does not allow to be assured in accuracy of the specified physiognomic parameters. During analyses of human faces in a context of physiognomy, and also in a context of aesthetic medicine and cosmetic surgery it is necessary to consider exact facial parameters. Namely it is necessary to do special photos according to which it is possible to see exact top of a head and exact line of a chin, and also exact outlines of other physiognomic facial shapes. Also it is necessary to consider photos in graphic computer programs for editing digital images. Or in special programming software for research of faces in physiognomy, or in computer software programs for analyses of formal lineaments and proportions of human faces in aesthetic medicine and surgery before performing of plastic operations and cosmetic procedures. And in particular before rhinoplasty during computer modeling new shapes of a nose, or during consultations before cosmetic procedures of surgical correcting of formal facial parameters of lips and a chin, if special computer programs will be developed. Besides in a context of physiognomy and astrology, and also in aesthetic medicine and cosmetic surgery it is necessary to consider that people have subjective opinions about facial appearance of other people, that is caused by proportional parameters of own faces. As if in facial features there are similarity to those or other geometrical figures then proportions of these figures are determining foe visual perception. Namely if the face of one person has similarity to shapes of any polygon, and the face of other person has similarity to shapes of the same polygon then two persons possess identical proportional parameters, and accordingly possess mutual appeal. And if in faces of people there are similarity to different polygons then mutual perception can be negative or loyal (positive), that depends on concrete geometrical ratios which can be seen in facial profiles. For analyses of mutual appeal and attractiveness it is necessary to apply charts which are shown above. Namely it is necessary to see polygons which correspond to proportions of human faces, and then it is possible to consider correspondences or inconsistencies of these polygons. The offered analytical method in a context of physiognomy, and in methodology of cosmetology or aesthetic medicine can allows to speak about attributes of beauty in faces of men and women according to geometrical calculations irrespective of subjective opinions. The following page results the information on the detailed physiognomic analyses of complex geometrical ratios and parameters of a human face.